James McGrew first backpacked in Yosemite at 4 months old and recalls childhood memories of frequent trips to Yosemite to paint and photograph. Today his award winning works hang in many private and corporate collections around the world and have exhibited in many solo and group shows, galleries, museums, national & international exhibitions including the Grand Canyon Celebration of Art Plein Air, American Impressionist Society, Oil Painters of America, Arts for the Parks, Pacific Northwest Plein Air, Sierra Foothill Conservancy Invitational, and numerous other invitationals. James is currently showing at: Holton Studio, Emeryville, CA; Howard Mandville Gallery, Kirkland, WA; Knowlton Gallery, Lodi, CA; Legacy Gallery, Scottsdale, AZ; Mountainsong Galleries, Carmel, CA. His work has been featured in numerous publications including magazines, books, covers, catalogs, and video including Sterling Johnson’s “Yosemite Lightdances.” Some clients include the National Park Service, Oregon Ballet Theatre, USA Gymnastics. A strong background in natural sciences helps James create paintings which convey nature’s geology, biology, light and ecology. In addition to degrees in biology, chemistry and geology, his master’s thesis (environmental education) focused on the role of art in Yosemite’s preservation as the foundation of our National Parks. 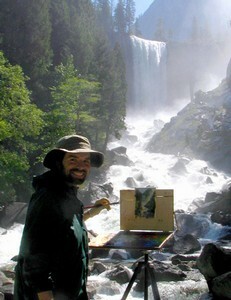 James prefers to paint direct from nature and backpacks several hundred miles each year with pochade box and tripod. He uses his plein air works as reference for larger studio paintings which may convey complex stories. Although James paints full time for most of the year, he also has worked as a summer seasonal park naturalist for 18 summers. He has presented as a keynote speaker at many major art and science conferences, including the Artists Impressions of California Conference and California Emergency Medicine Conference. Participants on his programs and workshops say his enthusiasm and love for nature is contagious. He enjoys teaching and his participants say that he has a unique ability to interweave art, science, and cultural history in an entertaining manner that’s easy to understand. In all his work, James uses the highest quality materials and time tested techniques for greatest possible permanence. “I use my art as a vehicle to communicate to a wider audience than I can via an interpretive naturalist program. My goal is to inspire others to appreciate, explore and hopefully generate a sense of stewardship for our natural areas and preserves.” James loves painting, climbing and backpacking along with his two talented daughters. Grand Canyon Celebration of Art (Best of show and 2x people’s choice award), Carmel Art Festival (People’s Choice poster award), Zion Plein Air Invitational, Laguna Plein Air Invitational, Sedona Plein Air Invitational. Please visit James’ website for a list of notable articles/publications, awards, events, etc.